The History of Cognac, dating back four centuries, Cognac, was a recognized wine-growing area long before cognac was ‘invented”, this area has wine producing records that date back to the 3rd century AD. Both the region and the beverage Cognac has a long history; rich with tales of nations, merchants, kings and aristocrats, wars, cold winters and hardships. Despite all this, as it aged, the product kept getting better and better, century after century. Some have referred to it as “the spirit of the gods”. Each company, in order to obtain the uniqueness of its categories of cognac, uses eaux-de-vie which are much older than the minimum requirement. 80 000 hectares (200 000 acres) of vines, unique climatic conditions, the soil and the proximity of the sea make the Charente region “a happy chance of nature, a lucky exception”. Double distillation in Charentais pot stills. The ageing of cognac can only take place in barrels made of oak from the Limousin or Tronçais forests. In fact the eau-de-vie will only become cognac after a slow ageing process in oak specially selected for its capacity to transfer the tanins when in contact with the alcohol, thus giving it colour and “bouquet”. The blending operation and the know-how of the “maître de chai” are handed down from generaton to generation. First, it is necessary to choose a proper wineglass. It is recommended that you use a tulip shaped glass. 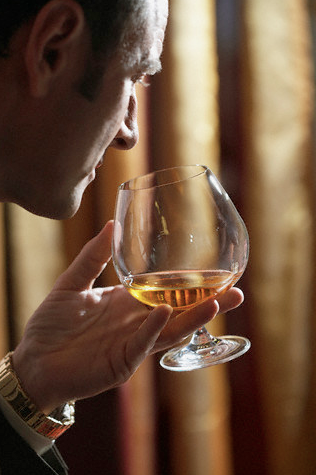 Pour 20-25 ml of cognac pour into the wineglass and heat in the palm of your hand for 8-10 minutes. Hold the glass up to the light, and look at the wine. Enjoy the appearance of the color – it is indicative of the age. The lighter the cognac, the younger the cognac. Take a sniff placing your nose at the edge of the glass and inhale. Swirl the glass and sniff again. In cognac there are many scents to detect, such as: floral scents like violets, iris, rose; fruit scents like pear, cherry, apricot, plum, fig, quince, grapefruit, jasmine, chestnut, orange zest, nut, or peach. Cognac pairs beautifully with chocolate or coffee. Take a sip, let the flavors dance on your tongue, swirl it about your mouth, let the wine warm on the palate before taking another. Enjoy the sensation of this special wine fill your head. A luxurious evening awaits with a snifter of cognac and an espresso! If you are going to blend a cognac for cocktails, use a VS or VSOP.